I can’t help but chuckle at the oxymoron I chose for the title of this post. I don’t really know if “vintage modern” is a decor style at all, but it’s the best I’ve got to describe this room. At the beginning of January, I set out to give this room (which is really just a large hallway) a more functional purpose as our home office. The catch? I had only $100 to spend to update the space. Let me tell you a bit about me. I love shopping for items to decorate my home. I hate spending money. I have a soft spot for vintage goodies. You can see why the $100 Room Challenge just makes me happy. Erin, from Lemons, Lavender, and Laundry, designed the challenge (which you can read about here) and hosts the challenge twice a year. 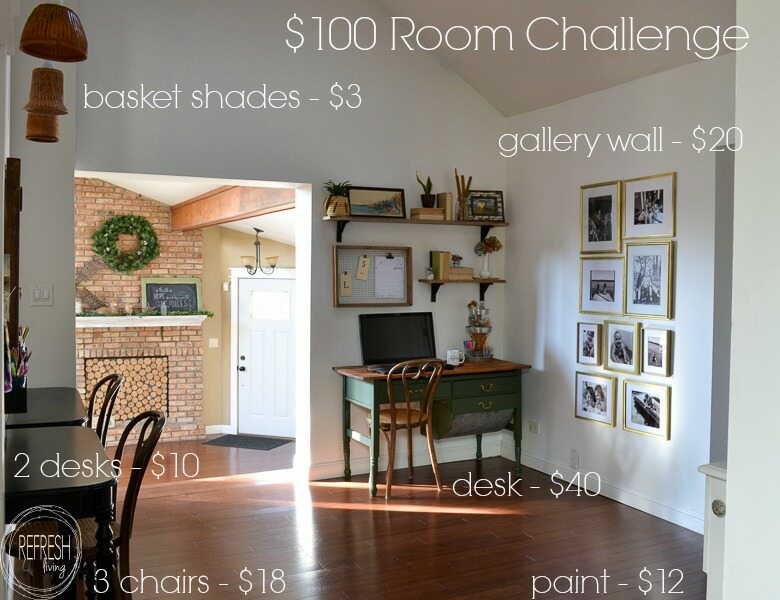 After checking out our new office, you’ll see a ton of other rooms made over for $100 or less. Here’s how this hallway looked before. 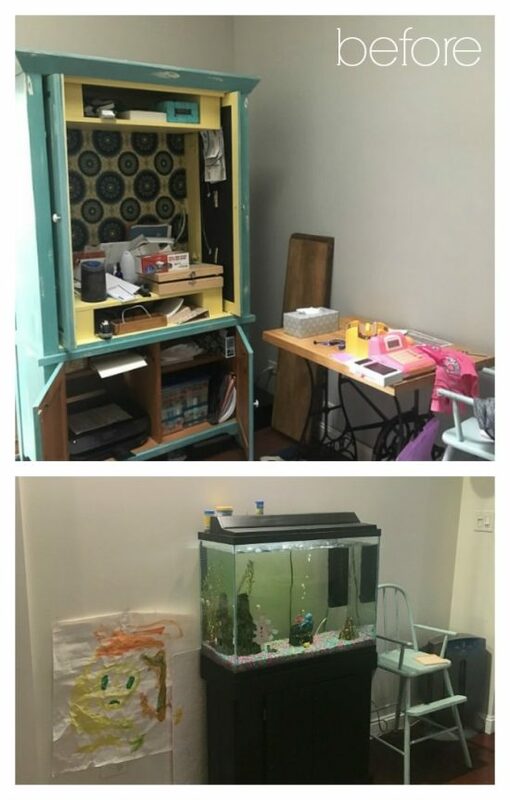 We had an obnoxious armoire/hidden desk, a fish tank, and a gallery wall above a buffet turned toy storage. 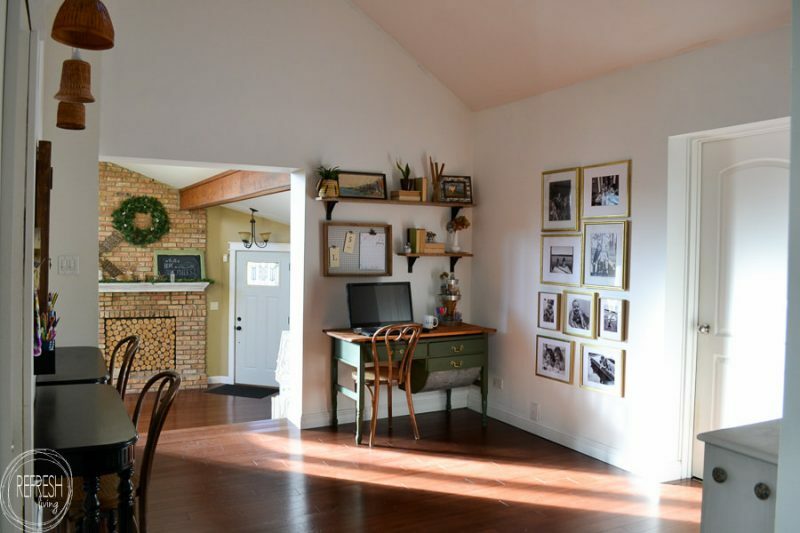 The wall with the gallery wall is exactly the same (except the wall is now white), but the other two areas in the room look much different, and much more functional. Welcome to our new “vintage modern” home office, with a place for both adults and kids to “work”. I’m still pretty amazed I was able to bring in three new desks and chairs within the $100 budget. I spotted this antique possum bellied baker’s table at an estate sale about one week after promising myself I wouldn’t bring any more furniture home with me until other pieces had been cleared out of the garage. But, at 75% off on the last day of the sale, I couldn’t pass up this table, especially with its $40 price tag. I made my kids’ desks from an old vintage table I found at a furniture resale store. They were having a sale on most of their dining sets, and I picked up this table, along with 4 beautiful chairs, for $25. I sold the 4 chairs for $15, and ended up with two desks for $10. You probably also noticed the three matching cane chairs. I found these at an estate sale as well, and I basically just told the lady that I rarely pay more than $5 for chairs (even beautiful ones like these). With it being the last day of the sale, she sold me the set of 4 chairs for $24. $6 per chair isn’t too far off from my normal $5 maximum! I used second-hand frames and spray painted them in gold to match and look cohesive. 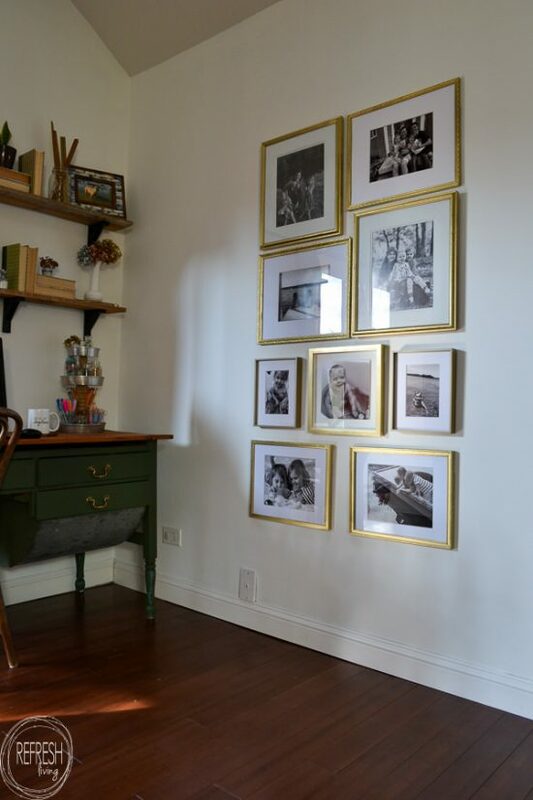 The most expensive part of this gallery wall was actually not the frames, but the white mats. Because I was able to get the frames for so cheap at an estate sale ($0.50 per frame! ), I was able to spend some extra money on the mats and getting the photos printed. All the other accessories were items I already had around the house – glass jars, my tiered tray from old baking pans, and vintage books. I just spray painted some dried hydrangeas with metallic spray paint I had on hand to create flowers that will never die. That Chicago skyline was painted by my grandpa. He was an amazing artist and I’ve been trying to bring more and more of his pieces into my home. I can’t decide if I like the room better, or the fact that I spent only $100. Did you add that up in your head? If you did, you’ll notice I went a little over budget. $3. Let’s just subtract that $3 from the leftover paint I didn’t use and will get to use on another project – okay? Holy Smokes! This is absolutely fabulous! 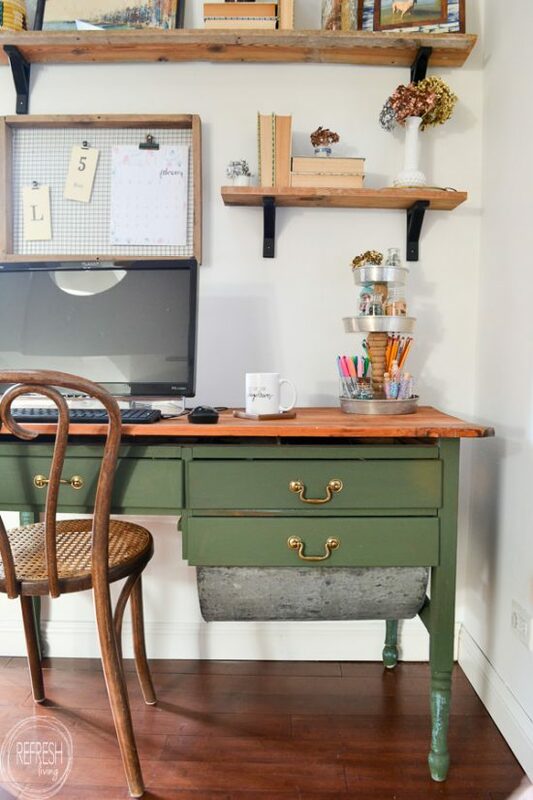 I am absolutely in love (and a bit jealous) of that green desk! So pretty and great job! What a difference $100 makes! Your office looks really good. WOW! I love, love, love, the homework area and those black desks! You did an awesome job! Thanks Maria! It was such a fun room to put together. I’d definitely say vintage modern is a style and you nailed it! 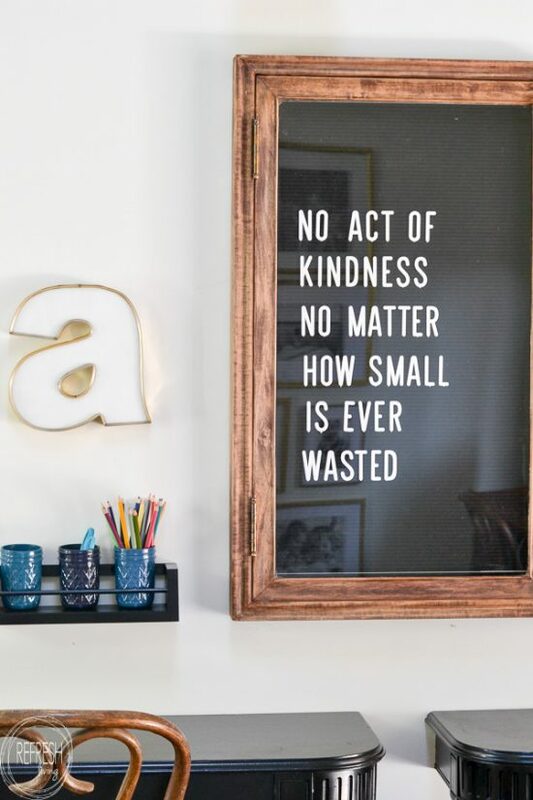 Love the vintage desks and that sign about kindness. This turned out so well! 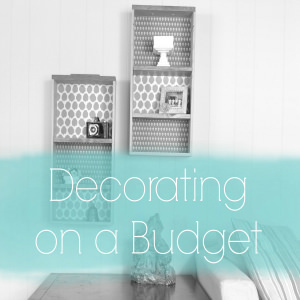 Thanks Ashley – it was such a fun room to put together! Vintage modern is how I would describe my style as well. 🙂 That desk is stunning! Your office space looks amazing! I really just love everything about this space! 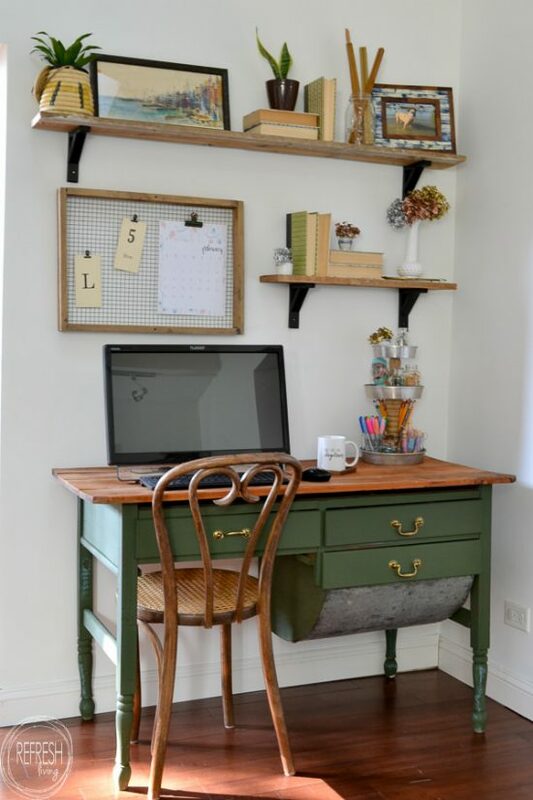 The desks are all SO cool, I love the gallery wall, too! Such a fun space! I totally think vintage modern is a thing, and you crushed it! All the changes you made in here are perfect. They really bring the space together and make it beautiful and useful. 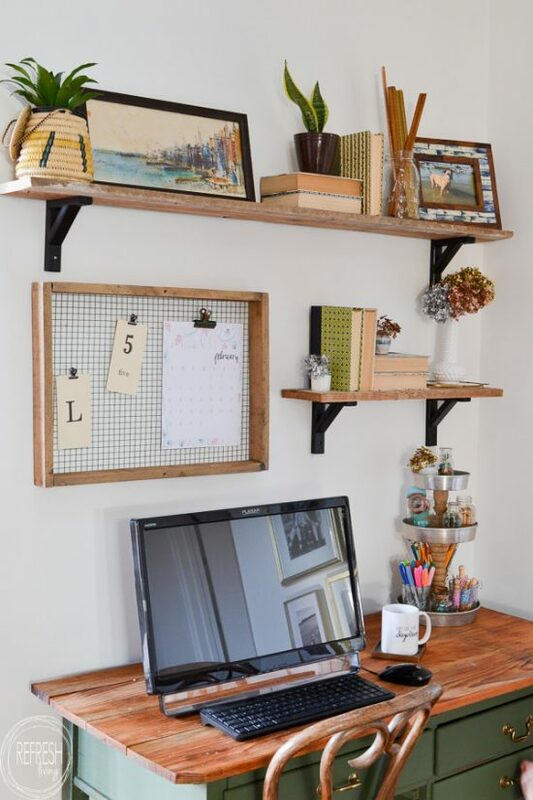 I love your desks and their styling! Thanks Meredith – I’m so glad this room is finally going to be a functional one! I didn’t realize how big this space was! I’m totally loving every single thing. 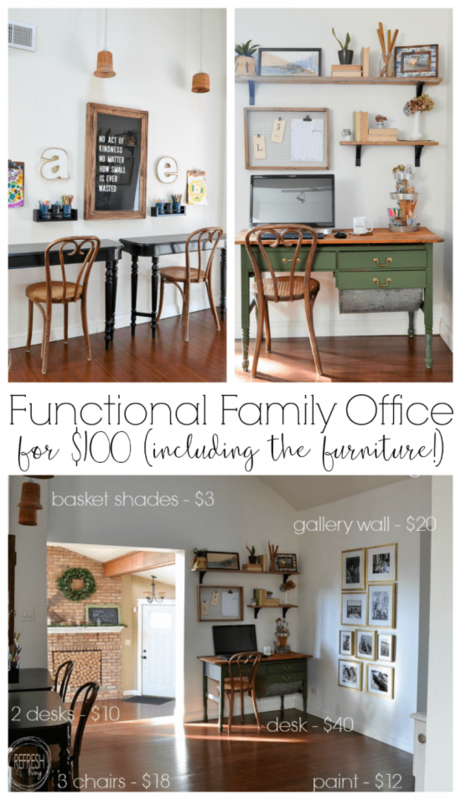 Those desks… the chairs… the letter board!!! Also, I need you to come shopping with me, I mean, seriously, you got some AMAZING deals. Thank you so much for joining in for another round of the challenge! Thanks Erin! Unfortunately, I waste a lot of time shopping but coming home empty handed. Every once in awhile I do snag some awesome finds though! Wow! What a great office space. I am really impressed by the transformation. And your choice of decor is right up my alley. I love vintage/antique. Thanks for linking up at OVER THE MOON Link Party. 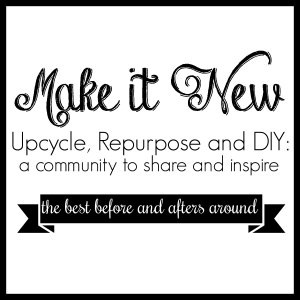 I know – I have a soft spot in my heart for old, beautiful pieces! This is so pretty, and I can’t believe the price! I’ve been wanting to go to estate sales, but never have. I’ll definitely be going now! Thanks so much for sharing your beautiful project! Thanks Lisa. You definitely should, although I will say they are hit and miss, some are great and others, not so much! Great transformation! Love all the vintage-retro touches. The “office” set up for the kids is really cute with the hanging basket lights. Thanks Victoria! My husband was not so sure about the baskets, but I love them! This is so great. I love the green desk, my favorite. Wow! You did some amazing, smart shopping! I need to take lessons from you! This space is seriously inspiring-what an amazing transformation. Although I love everything about it, I think my favorite part is how you incorporated your grandfather’s artwork. It is a beautiful piece! I love to see beautiful rooms that show depth and heart and are not just completely brand new visions of a designer. Well done! You get the prize! This is the best post I’ve seen in a long time. I can scarcely believe you did all this for $100–wow! Your office space looks amazing. I’ll say it again: WOW! Thanks so much, Richella! Such kind words AND thanks for the feature! Your office looks amazing! I can’t believe you were able to create all of this for $100! 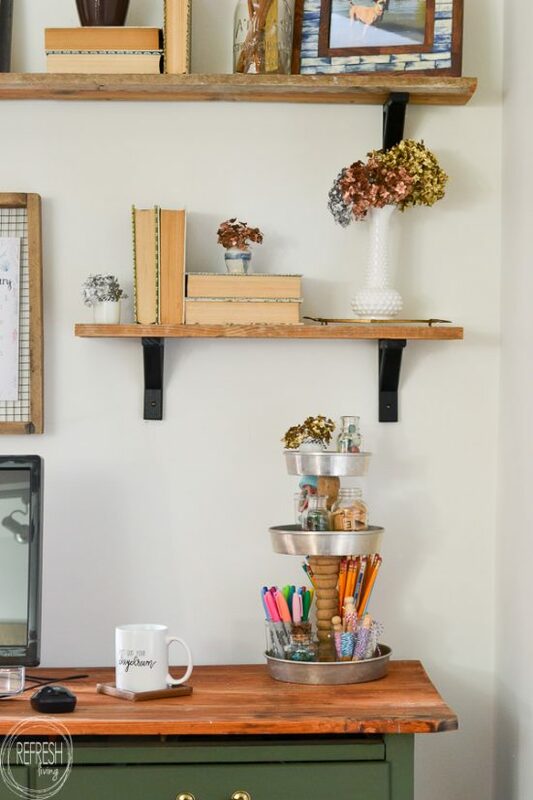 And I totally think that vintage/modern can be a thing 🙂 Thanks for linking up with Merry Monday – I’ll be featuring your office at our next party that kicks off tonight. Hope you can join us again this week! This is jaw dropping – you accomplished so much and I want you to be my neighbor and take me shopping! Those deals you score are amazing. 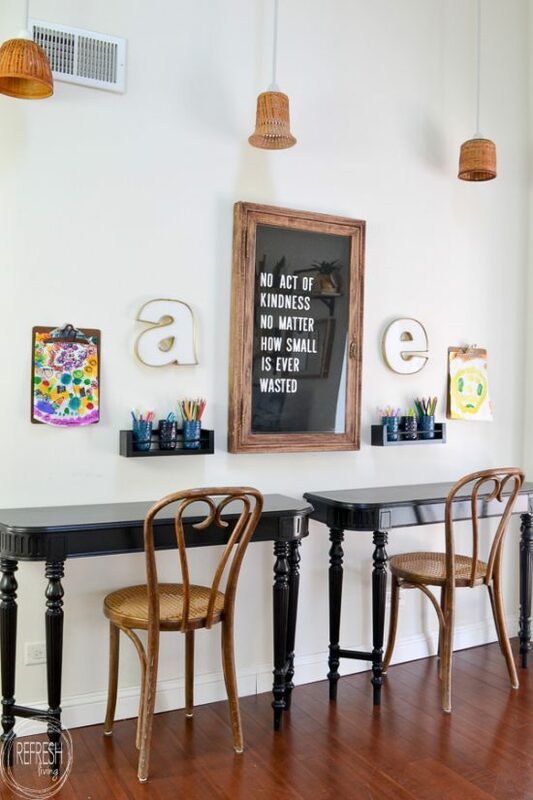 I love every detail but my favorite are the desks and the vintage letter board. This room is so gorgeous and you nailed “vintage modern” to a t! Thanks so much, Melissa! I love shopping buddies! 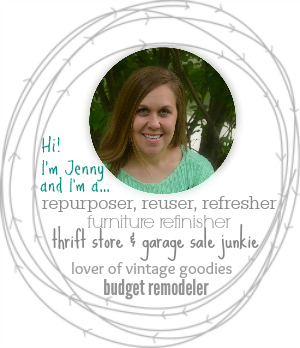 this looks so awesome, jenny! i love the sign in the kids area!